News has emerged that Tashi Wangchuk is being denied access to his lawyer. On 15 January 2019, lawyer Lin Qilei (蔺其磊) attempted to visit Tashi at Dongchuan Prison, Xining in Qinghai, to discuss his dissatisfaction with the original judgment and appeal, and his wish to file a new petition to the Supreme Court. On arrival he was told that the request must go via the Internal Investigations Department but his application there was also denied. The Head of Department, Yang Dong (杨栋), was told that permission for a visit would be needed from a “higher level” because Tashi Wangchuk was “involved” with a “sensitive crime”. Lin Qilei has been promised that he will be contacted shortly with an update. Since his trial Tashi Wangchuk has only been allowed three family visits. Directly after Tashi’s first appeal hearing in August 2018, his family were able to meet with him but, when they attempted to bring him some clothes the following day, they were told that Tashi had already been moved to Xining. His siblings were able to visit in November 2018 but are currently waiting for permission for a further visit. Tashi Wangchuk, a businessman aged 34, was detained on 27 January 2016. His arrest came less than two months after he featured in a New York Times article and video report  about his formal complaint against Chinese officials for failing to support Tibetans’ right to Tibetan language education. Tashi was held for two years without trial and his lawyers had limited access to him during his pre-trial detention. In May 2018 he was sentenced to a five year prison sentence on charges of “incitement to separatism”. At least eight independent United Nations human rights experts have also, on multiple occasions, raised questions with the Chinese government about the legal grounds for Tashi Wangchuk’s detention and his treatment. The experts have asked China to provide information as to why the charge of “incitement to separatism” links to his work to press for linguistic rights, and what measures are being taken by the Chinese government to ensure “the free exercise of the rights to freedom of opinion and expression and freedom to take part in cultural life” in Tibet. 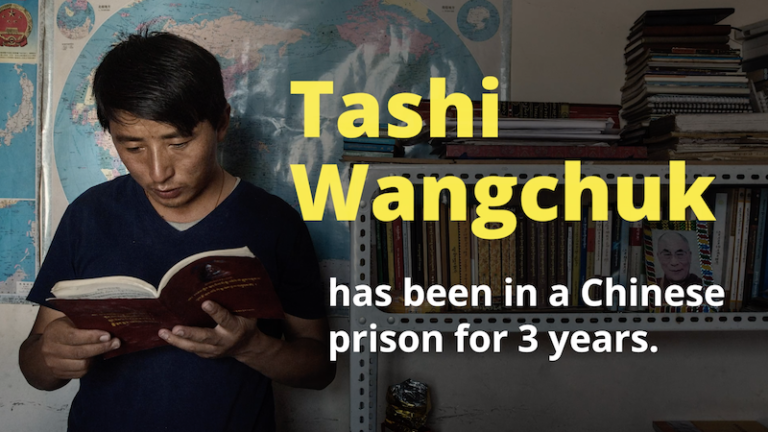 We are in no doubt that Tashi Wangchuk has been criminalised by China for shedding light on the State’s failure to protect the basic human right to education and specifically Tibetan language education.